Discussion in 'Chassis restoration' started by waltonj, Jan 8, 2012. Im at the point in my restoration to install the brake lines and fuel lines on my '70 triple black GS 455. I'm wondering what color the fuel line clips and hose clamps were originally? Brake line clips? Brake hose retainers? Were the fittings on the rubber brake hoses zinc plated or something different? All of the old stuff was too rusted up and corroded to tell what color they were originally. Also, I'm having trouble finding new front sway bar bushings that fit the 1" sway bar.. Anyone know where to fnd these?? The fuel line clamps are red and olive green. I don't want to tell you anything about the other stuff, 'cuz it would be better from someone that has the same car. I'm sure about the clamps. thanks, but which ones are red and which ones are green? are the larger ones (3/8") supposed to be red? I'm assuming that most 1970 gran sports with disk front brakes had the same clip color/configuration(flint plant). am i wrong? The larger 3/8" are green, the smaller 5/16" are red. You can go to Advance or Autozone and buy Help stuff...a package of spring clamps and they will be the right colors. You can get them from all the repro houses also. 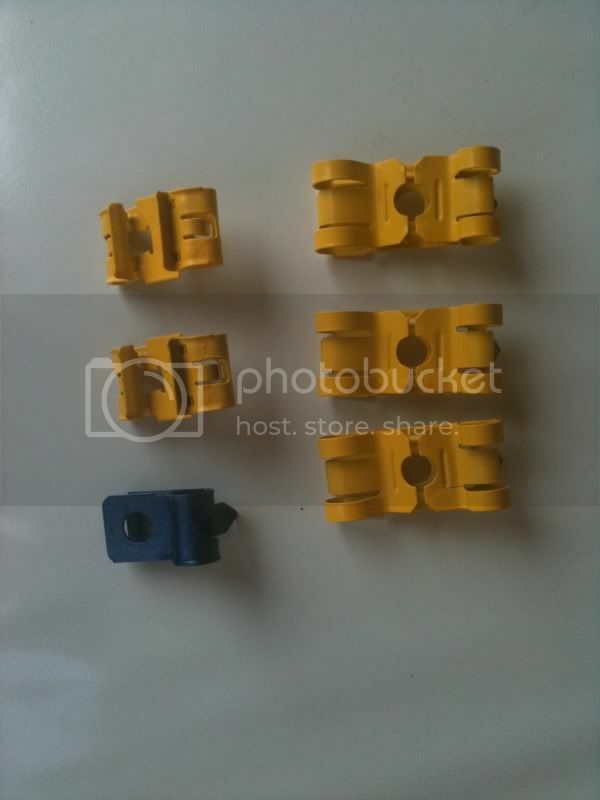 The brake clips, the horseshoe shaped clips that hold the hoses on the brkts varied in finish. I've seen 2 finishes, cad gold and black like anodized. They may have had silver cad also, and I don't know what Buick was using in that time line. They could have used all 3 finishes in the same plant in the same year. They would get say 100 boxes, when they used them up, maybe the next batch came from a different supplier. The frame clips you can get from Inline Tube in the right colors. Look at their website, they have all these clips and widgets. Also look at that Kokomo or whatever 5 page 1970? Buick GS thread from yesterday. There are nice detail shots of some of this stuff, but they say everything is not 100% correct. I realize the factory used different variations of parts due to mulitiple suppliers, but what is acceptable come show time? Wondering if i should trust inline tube on their color selection. The Inline guys are really into Olds, they just do Buick + Chevs, etc. 'cuz it's more biz for them. You definitely can't trust everything they say, nor can you trust any other major supplier who says there parts are exact repros. I've also received lines from them that aren't bent like my originals. It drives me crazy, I order dated plug wires (from another supplier)for my 67 GS, they come with short brown straight plug boots. I'm fairly positive the original boots were black, longer, and bent at like a 30 degree angle. I can see pics of them in factory literature. UGH.... Anyways, I know Inline WAS absolutely making colored clip sets before in addition to their regular sets. They may have been a limited run, or they may be in the Olds catalog. yeah, i was thinking the same thing on the accuracy of the repro parts. Their marketing strategy includes misrepresenting the parts they have to offer in order to get more orders.. seems like some distributors need to either update their part description, or hire someone to investigate and advertise the truth about the parts..
Anyways, back to why i started this thread. It sounds like i need to do some detailing on the clips. Still wondering about the front and rear brake hoses and the color of the fittings. here are some pictures of what was on te car (assuming they are original, but really have no clue) and what i bought from inline tube. Check Rock auto. They sell 1" sway bar bushings. I got nice ones from NAPA that I am using but I had to cut the slit. It wa easy. As far as inline tube goes you have to pick and choose. I bought several things from them that would not work. Now way no how. They sold me tie rod connecting bolts with the correct head markings. They were however 5/16" when originals on 71 were 3/8"???? They also sold me Idler arm bolts that were to short. The barely made it through the arm so the nut barely had enough thread to catch on. They told me I must have aftemarket arm?? Yes I did but it is the same thickness as original?? The washers that came with the kit were also this hardware store washers not the thick correct ones so maybe they tried to make up for short bolts that way. It still did not work. The grade on the bolts was also less that the originals. Lucky AMK had the correct stuff. The big fuel/brake line clips they sell are also not correct. They bolt in the wrong place. They do however sell nice clips that go on top of the rear spring tower for the fuel lines. Also the blue brake and metallic green clips are pretty close however they stamp their name on them. Thanks for your time and info! this is all a huge help! anyone have any input on my brake hose issue? I think the brake hoses should have cad gold fittings, single crimp not double crimped. I think they had a red stripe in 70 with specific info. I have a 67 NOS hose here, it's single crimp, cad gold fittings, yellow stripe. The color of stripes were changed as the safety requirements of the day changed. So a yellow stripe met 67 requirements, a red stripe met 70 requirements. That sounds like what my old ones look like (minus the red strip i can't see). That being said, i am in the market for some NOS 1970 brake hoses. Know anyone who would have anything like this? I realize your doing a concours resto, but why use 40+ year old brake hoses? I doubt you would lose any points for that. I guess you have to draw the line somewhere, and for me that would be it. Dave- Are the 3/8" clamps supposed to be olive? I thought they were yellow originally? What would you do for fuel line clips if you wanted to upgrade to 7/16" or 1/2" fuel tube? I believe he was talking about the hose clamps that connect the 2 piece fuel lines together. The clips that hold the line to the frame would be yellow..